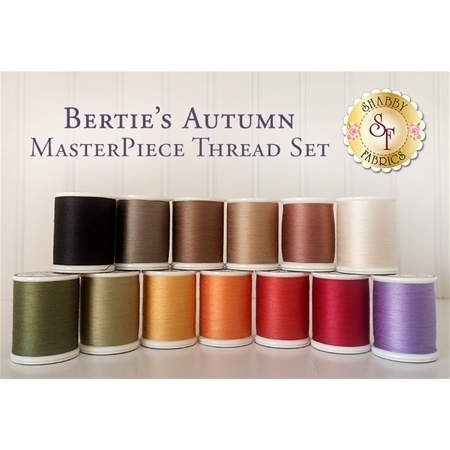 This 13 piece, 50 wt, 3-ply, 100% Extra-Long Staple Egyptian Cotton MasterPiece thread set has been put together specifically for the Bertie's Autumn BOM quilt. Set contains eleven 600 yard spools by Superior Threads. The colors are Masterpiece color numbers: 132, 135, 136, 147, 152, 157, 160, 161, 162, 170, 173, 180, 181. These threads are intended for machine appliqué!